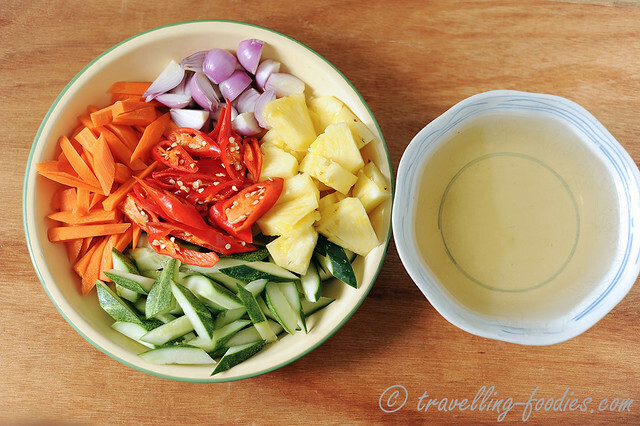 While the chicken was slowly braising in rendang sauce, I started preparing an easy pickled mixed vegetables, from a recipe I’d learnt a long time ago from eating at the famous Hainanese chicken rice stall at the basement of Katong Shopping Centre. I didn’t learn it from the chicken rice people of course, but instead, I brought home a takeaway of it for my family and my mum decoded the marinade in like just 2 seconds! And the flavours were spot on! We end up calling this “achar puteh” casually at home, since it does not require a rempah tumis for the vegetables to be mixed with and more importantly, the vegetables do not require any sunning! It is just as good to go with rendang ayam as it is with Hainanese chicken rice! The only thing about this “achar puteh” is that it has to be eaten within a day after it is made, before the texture of the vegetables past their prime, unlike a traditional Peranakan aceir that can be kept for quite a while. But no worries for that as it is usually polished clean within the same day, first with either rendang ayam, or with poached chicken and fragrant steamed rice. The remnants are good for snacking for the post-dinner TV session! 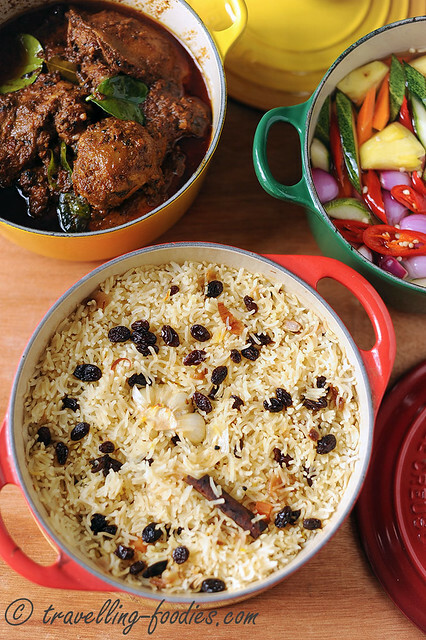 The final is an Easy Pilau Rice to go with the rendang ayam. I’d soaked the basmati rice first for a good 30 minutes and drained the grains thoroughly. 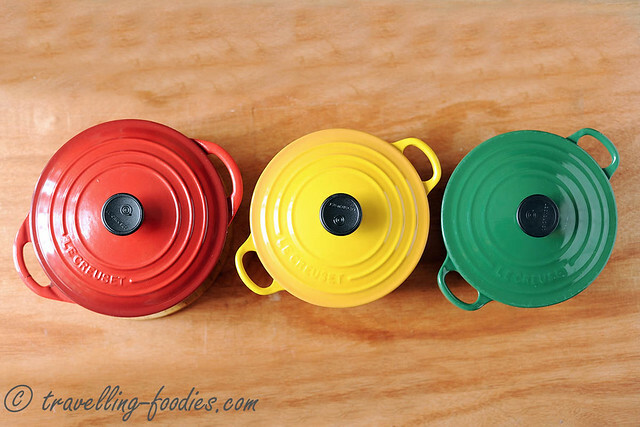 After that is just a simple sauteeing of some familiar spices and some other aromatics in butter and the rice is cooked carefully in yet another Le Creuset French oven and ready in just 20 minutes or so. This is a really easy recipe I’d learnt from one of my Indian friends. It is less elaborated than the traditional biryani but no less delicious. It can be jazzed up with chopped and toasted nuts like cashews and almonds, as well as dried fruit like dates, prunes and raisins. I’d even tried adding dried papaya once and it was great! Given the right amount of spices and heightened by the aromatics, it can be really flavoursome and goes well with the rendang ayam. 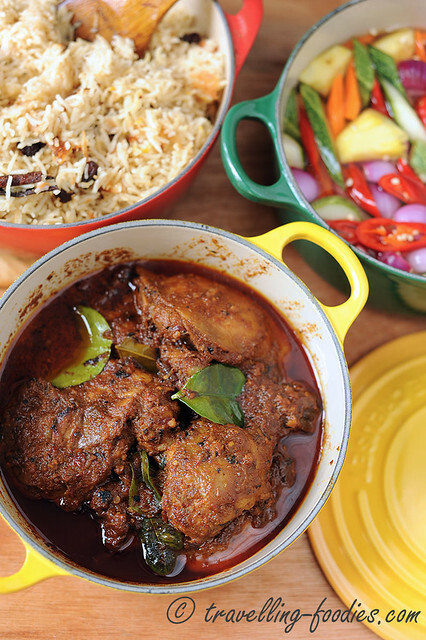 For the Rendang Ayam recipe, please click here. 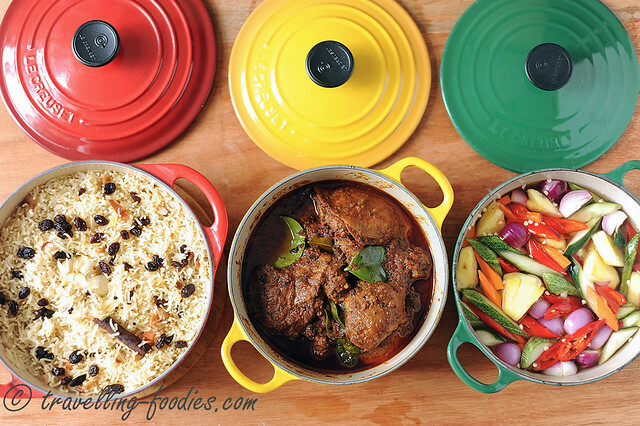 And for those interested in making other dishes with the generic rempah, please click here. First, slice the cucumber lengthwise into half and rub the two sides together until it foams up nicely before rinsing away the foam under a running tap. This helps to remove the mildly toxic cucurbitacins in the cucumber which gives fresh cucumber that bitter taste. Proceed to remove the seeds and cut the cucumber into strips around 2-3 cm long. Cut the peeled carrots and pineapple into chunks around the same size as the sliced cucumber. Cut off the stem of the fresh red chilies and slice diagonally into strips the same size as the others. 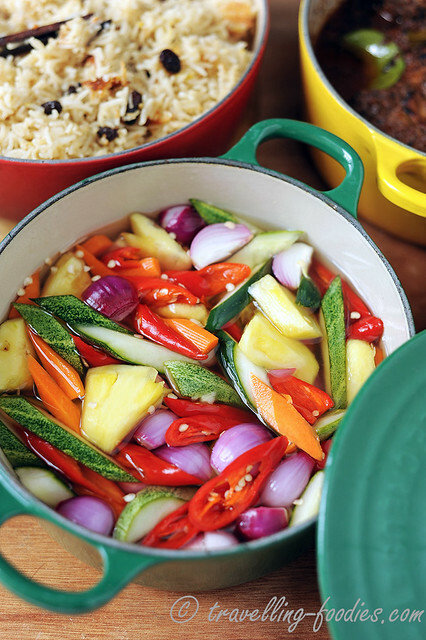 In an enamel coated pot, pour in all of the pickling ingredients, i.e. apple cider/white vinegar, sugar, salt and water and bring to a gentle boil before turning off the fire. Let the liquids cool down completely. Toss the sliced vegetables into the vinegary concoction which has been cooled down to almost room temperature, and give everything a good mix. Make sure that all the ingredients are well submerged. Cover and leave in the fridge to chill or 30-40 mins, tossing the vegetables during halftime. In a heated French oven, add the butter and melt down slightly before adding the cassia bark, cardamon, cloves, bay leaves, star anise and minced onion. Saute until the onions turn translucent and the whole mixture is really aromatic! Add the halved garlic bulb, presoaked and drained basmatic rice, salt and sugar and stir fry around a bit until the rice are all well coated with the buttery mix. Add the water or chicken stock, yoghurt and soaked saffron strands. Bring the mixture to a boil before lowering to the weakest flame over the stove, cover and let it cook for 30 mins. Refrain from opening the cover of the lid at this time. After the cooking time is up, carefully remove any bits of spices which is seen on the surface of the rice. Fluff up the rice gently with a fork and check that the rice at the bottom is also thoroughly cooked and well flavoured. If using, sprinkle the raisins and/or chopped dried fruit and nuts and fried shallot crisps at this point. Use the fork to incorporate these added ingredients into the rice as uniformly as possible. Cover again, turn off the heat after 30 seconds or so. Let the rice sit covered for another 15 mins before serving. *I used a standard 160ml measuring cup for rice. Oh yeah, I made a simple omelette with my last batch of “cha om” which I brought back from Bangkok as well. For those interested, the recipe is found here. Happy Thanksgiving everyone! Counting my blessings from family and friends who have loved, cared and supported me through this difficult year! And may all of you be blessed as well! This entry was posted on November 26, 2015 by Alan (travellingfoodies). 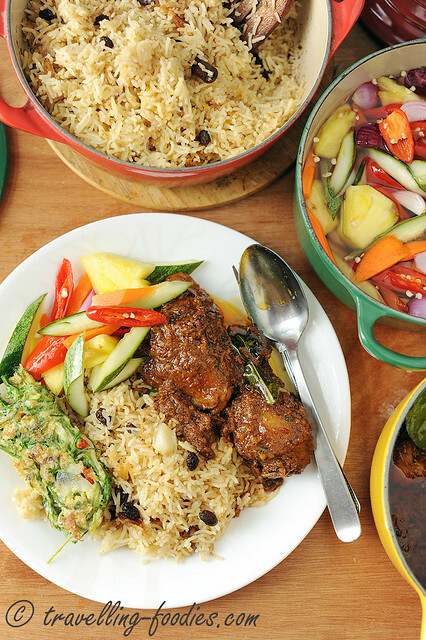 It was filed under Food, Simple Eats, Travel and was tagged with bay leaves, cinammon, onions, pickled vegetables, pilau rice, Rendang Ayam, rendang chicken, saffron, shallots, spices, star anise, thanksgiving. 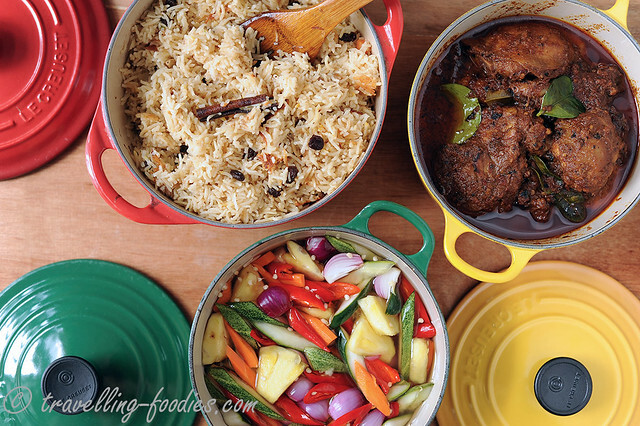 Great post, lovely pics.can smell the aromatic basmati rice here too. Thanks for always been so generous sharing your peranakan specialty, will try out all of these combination . I tried yr generic rempah and I want to thank you for sharing such a great recipe. I used it for ikan bilis and assam fish and they both tasted so good. Keep up the good work!